Texting is a very basic feature of a Mobile phone whether it is an old cell phone with Keypad or your expensive iPhone. Instead of having lots of messaging apps we find ourselves stick to the messaging app and on the iPhone, it is not just a texting app it also works as iMessages. To use this app effectively you should also know some tips and tricks which are going to help you in improving your texting experience. So, if you own an iPhone then you must know these tips and tricks. Your alert tone will tell you who has sent you a message. This is how you can set different message tones for different sender on your iPhone. Navigate to the contacts app find the contact for which you want to change the text tone. Tap on Edit and scroll down to Text Tone now choose a tone different from the default one and this will be the text tone for chosen contact. When you get a notification of messages on your iPhone. You get a repetitive notification. If repetitive buzz for a single text annoys you then here is how you can disable it. Go to Settings > Notifications > Messages > Repeat Alerts. Here you will be able to set alert for Once or as per your choice. You can enhance the privacy of your text messages by disabling the preview of your messages. To disable preview of your messages, Go to Settings > Notifications > Messages scroll down to Show Previews and choose from Never or When unlocked as per your choice. When you are typing a long message, you find it painful to navigate in the message to make some changes in the text but devices having 3D touch have a perfect solution to this. 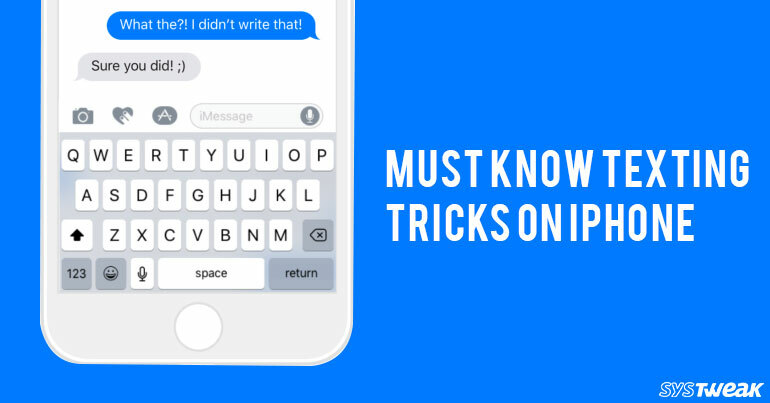 While typing a message 3D touch on the keyboard and you will find that your cursor will work as trackpad and you will be able to quickly navigate in the message you have just typed. You can quickly preview and send a quick reply to messages by using 3D touch. To do this you can 3D touch on any conversation without opening it and slide up you will see quick reply options from here you will be able to send quick reply to a message. This is how you can make texting fun and convenient for you. Keep having fun over iMessages or text messages on your iPhone with ease and better privacy.